The sales module is where you manage quotes, orders, shipments and invoicing for sales made across all of your sales channels. 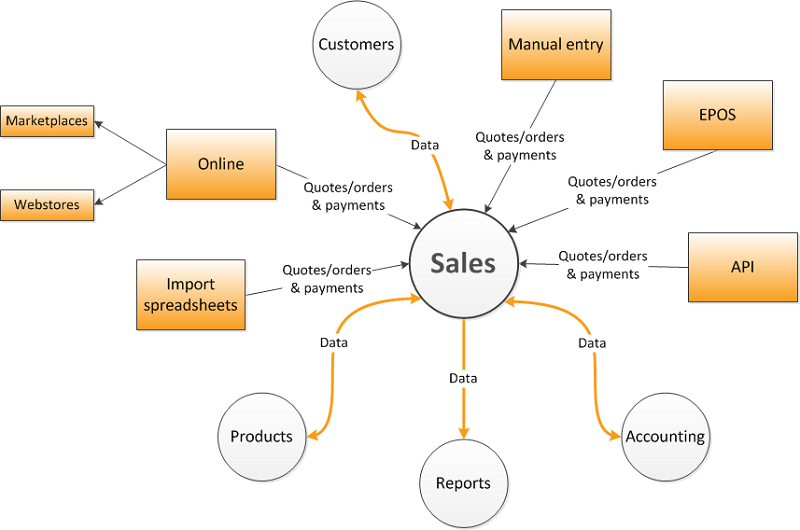 It draws on and records data in other modules to provide inventory, customer and accounting management. In Brightpearl a sale begins with a quote or order. From the order, fulfilment is performed to create goods-out notes for each shipment - multiple shipments can be created from a single order. Goods-out notes are processed through printing, picking and packing before being shipped. To complete any order it is marked as paid and invoiced. Payment, fulfilment and invoicing can be done in any order to suit your processes. Sales statuses are used to represent the stage the order has reached in your sales cycle. Lists and reports can be filtered to include or exclude orders of any status allowing you to create your own processing lists. All your different processing lists can be saved as presets ready for you to visit regularly each day and action all your orders. A quote status indicates that the customer has been quoted a price but the order has not yet been approved. Exclude quotes from your list of orders to be fulfilled and shipped so they are not accidentally processed. A new order status indicates an order which is confirmed and is ready to process. Include these orders in your list of orders to be fulfilled and shipped. An order which has been forwarded on to the next stage in your sales cycle can be considered in progress or processing. These orders can be excluded from your list of orders to be fulfilled and shipped, but might be included on a monitoring list to highlight any orders which have been in progress for too long. A complete order is one that has been fully processed and no longer requires any action. These can be excluded from processing lists. Remind days can be assigned to statuses. This enables Brightpearl to provide notifications when the status hasn't been updated for a period of time. Notifications will appear on the notification tool bar on the right-hand side of the screen. An email address can be assigned to a status so that each time an order is placed on that status someone is alerted via email. Custom text can be added to the status which will appear in every email. If a sales status is set as public, orders on that status can be viewed by customers logging into the webportal, orders which are on private statuses will be hidden in the portal and only visible to users in Brightpearl. If a status is no longer needed it can be hidden so that it can't be assigned to orders and is not available for filtering, but it does not require any orders already on this status to be changed. Use this option instead of deleting statuses which have already been used. When a new sales order is added by a user it will be assigned this status. This applies only to orders manually added by a user. Each channel can also have its own order status defined. This status indicates that the order is cancelled. An order on this status will automatically be excluded from sales reporting. 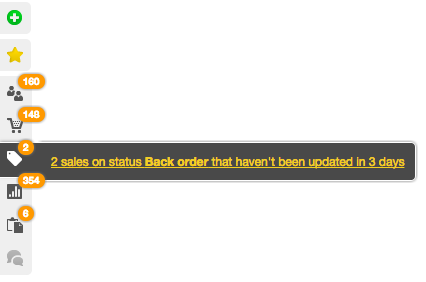 If an email is sent from the order the status will automatically be updated to this status. If an order is marked as approved, either by a user in back office, or by a customer via the webportal, this status will be automatically assigned. When the order is marked as invoiced the status will be automatically updated to this status. When items are split from the original sales order the new order will automatically be assigned this status. This status can also be manually assigned to an entire order without splitting. Inventory allocation involves reserving stock for the customer. Until inventory is allocated to a sales order it is still available to sell and will be added to sales channels. Allocation removes the items from on hand inventory, but leaves them in stock. EPOS sales - - Yes Completed EPOS orders are auto-shipped so allocation is not relevant. Allocation is automatic for on-hold EPOS sales. Downloaded orders Yes Yes Yes Bundles are not automatically allocated so must be done manually. To allocate all items use the Allocate all link below the order rows. To allocate individual items or products enter the quantity directly on the order row. Save the order to complete the allocation. The inventory levels and the order allocation status are updated after saving. Note: Orders are always allocated in the order in which they are listed. Ensure you prioritize order allocation by sorting by the relevant column, e.g. created date. Add additional columns in My Preferences. Go to Sales > Recent Sales/Quotes . Use the column headings to sort the orders in priority order - so that the most important order is at the top. Use the filters to search for the orders requiring allocation. Use the checkboxes to select the orders to be allocated. Click the allocate button at the top of the list. Select Allocate in the pop-up window. Click the Allocate selected orders button. This will reserve all the inventory for the selected orders until there are no more on hand items available, prioritizing the first order listed. Fulfillment is the first stage of shipping or drop-shipping an order. It is the process used to select some or all items on an order for shipping from one or more warehouses or suppliers. Fulfillment will create a goods-out note per shipment from each warehouse, or a drop-ship purchase order per supplier. Once order rows have been fulfilled the stocked items cannot be sold to anyone else unless the goods-out note is deleted. Drop-shipping is where the supplier is asked to deliver the goods directly to the customer. In Brightpearl this process always begins with a sales order which is then fulfilled to a purchase order, instead of a goods-out note. If you select no, you will find an additional action against any drop-ship purchase orders to Mark as Shipped. Selecting to do so will mark the entire order as shipped, and automatically update the parent sales order rows as well. You can also mark the parent sales orders as shipped in bulk from within the Purchases list. If you choose to mark the drop-ship purchase orders as shipped, you will also have the option to enter a tracking reference and shipping method. These details will be added to the parent order as an order note. 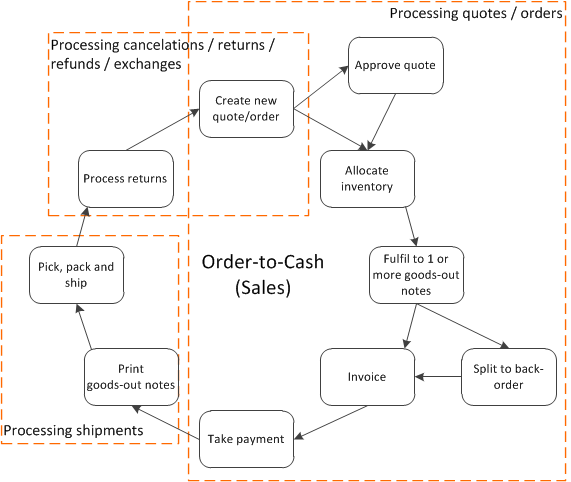 Every sales order requires a customer record to be created, even if it's a one off sale. The customer record is also used to set customer credit terms and limits, assigning them a price list, special tax codes or account codes for reporting. The customer record also provides full order and financial history and details of their outstanding balance. Keeping in contact with customers can be done via email or text message (requires Clickatell app). Any communication sent through Brightpearl will automatically be recorded on the customer timeline for future reference. And should any emails be sent outside of Brightpearl, they can also be added to the timeline by forwarding the email to your Brightpearl Mail Store address. If cost of sales accounting is not used then cost of sales must be manually entered into accounting periodically. Report on your sales by sales channel, brand, top customers or top selling products, lead sources, or product types, use additional features to view results for a specific team or staff member. Or check out the profit & loss report for your overall profits compared to previous periods.